Simon (Jason Bateman) and Robyn (Rebecca Hall) are a successful couple who have moved to LA to start a new life. On paper, they have it all - happy marriage, successful careers, gorgeous house. However, a chance meeting with Simon’s old school friend, Gordo (Joel Edgerton), proves how fragile their lives are beneath the surface. As Gordo appears again and again, often leaving unsettling gifts, Robyn and Simon begin to wonder if they can ever escape the secrets of their past. The Gift is a really enjoyable thriller - one that feels unsettling from the start and then gradually builds the tension towards a dark and twisted conclusion. Before I go on, a warning. The Gift is a film that is best watched with as little prior knowledge about the plot as possible. The less you know the better, in other words. Don’t even watch the trailer. My review of this film will not include spoilers. However, you may still want to watch The Gift first and then come back to this film review. The Gift was written, produced and directed by Joel Edgerton. Quite the impressive feat. On the basis of this movie alone, I am looking forward to much more from this exciting Australian filmmaker. On the face of it (and even from the trailer) you might be forgiven for thinking that The Gift is a typical stalker horror. Seen one, seen them all. This is just what Edgerton wants us to think. He plays with stereotypes - with the thriller genre's classic tropes. While he doesn’t include anything particularly new, he does turn the old on its head. In this way, The Gift feels all the more enjoyable when it turns out to be far superior than a run of the mill thriller. Edgerton wanted Rebecca Hall for the part of Robyn. He felt that she could bring a complex mix of intelligence, open heartedness, fragility and strength to the role. And she certainly does. Having enjoyed her performance in The Awakening, I hope to see much more from Hall in the future. She is such an interesting actress. The choice of Jason Bateman for the role of Simon was what Edgerton calls an “out of the box” decision. Initially, the director was looking for a ‘jock’ type character. However, Bateman brings a far more nuanced and interesting angle to the film - someone who is where he is because of the subversive power of words. I really liked Bateman’s performance. He hasn't had much of an opportunity to step outside of the straight guy role in romantic comedies and The Gift shows he is capable of so much more. Edgerton, meanwhile, is superb as the socially awkward Gordo. His performance is so still and quiet - he is like the creepiest blank canvass. I didn’t know what to make of him or what he would be capable of doing. This then started to worry me. What would Gordo do in the end? What would the film reveal about Simon and Robyn in its final act? Would the movie sacrifice its hard earned tension for a ridiculous conclusion? I think I can be forgiven for thinking this - so many thrillers go bonkers at the end and leave me feeling largely underwhelmed. This happened to me only recently with The Call. 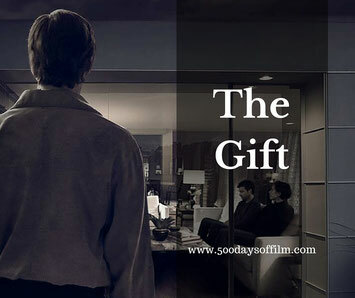 I am pleased to report that The Gift maintains its dark and twisty nature from the first to the very last scene. While the film’s ending was extremely unsettling (a feeling that I couldn’t shake for some time afterwards) it was also satisfying. I would highly recommend The Gift and I am very much looking forward to Joel Edgerton’s next film. Movies are sure putting me off big windowed houses... brrrr...! Have you seen The Gift? What did you think of this film? I would love to know if you enjoyed it as much as me… do leave me a comment in the box below!